My first interactive e-book app, Mousey the Explorer has been published in the InteractiveTouchBooks.com bookstore. So this will be my toe in the water for e-book app making. I made up this little app-trailer for YouTube. 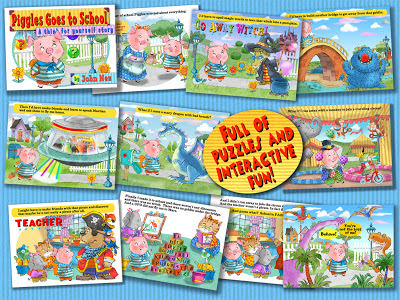 This e-book app is filled with interactive sounds, animations, puzzles, coloring and musical activities. I'm the actor, writer, producer and director. I do the set-design, lighting, costumes, makeup, stunts, choreography and special effects. I'm also the cameraman, technical wizard, animator and I make the coffee. I have to say, it's almost boring to do just plain flat digital art that doesn't have sounds, motion and interactivity. Here's the movie trailer to 'Mousey the Explorer'. 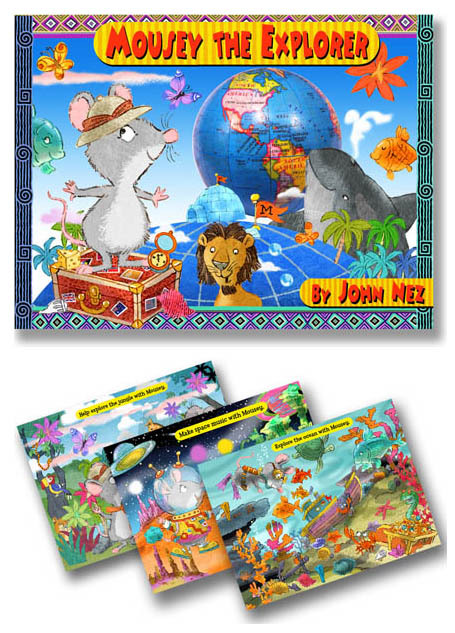 So feel free to pass on this link for some e-book interactive fun! The term interactive means different things to different people, from choose-your-own-adventure stories to ebooks with tappable read-aloud text to game-like animated book apps. 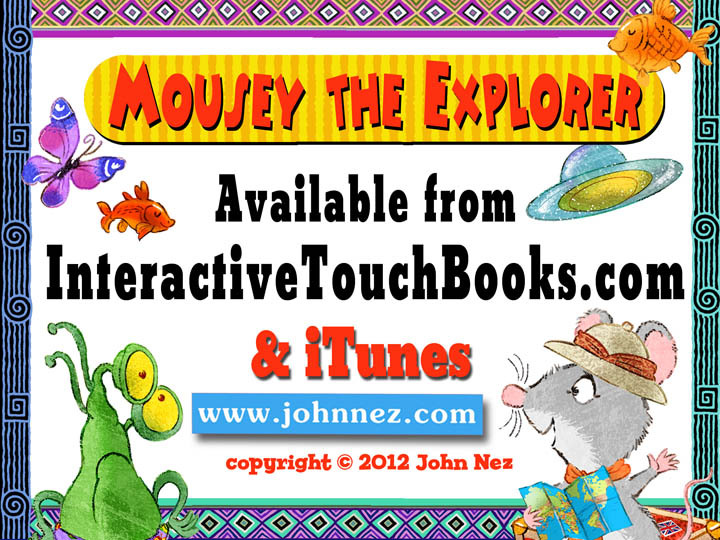 This blog post by Curating Book App Mom discusses iBooks Author and interactivity. Seems like we need better terminology to describe these digital books…but they're a moving target! In order to download the free iBooks Author app, you must have a Mac with the Lion OS installed. To read the souped up iBooks you need the free iBooks 2 app on your iPad. The free sample of E.O. Wilson's Life on Earth has embedded videos, animations, photo galleries, 3D models you can manipulate in any direction, clickable maps, quizzes, and more. It's quite sophisticated, no doubt about it. The file size is large, though. One of the features I'm interested in using is embedded Keynote presentations. I think the file sizes for those could be much smaller than full videos, while still allowing movement and user-directed interaction. [Update 2.23.2012]: A (currently) free 94 pages ebook, Publishing with iBooks Author by Nellie McKesson and Adam Witwer is available from O'Reilly. It covers the ins and outs of text formatting, tables, widgets, and much more. To get an excellent overview of iBooks Author's features and what it can and can't do, check out this post by Ben Vanderberg. Here is Apple's iBooks Author Support, which has several articles and tips such as to use "iPad safe fonts." There is also an iBooks Author forum here. The templates that come with iBooks Author are set up for textbooks, with Chapters, Sections, and pages. This is great for textbooks, cookbooks, craft books and so on, but excess baggage for picture books, my primary interest. I haven't tackled stripping out those features myself yet, but came across this article by Dani Jones that shows how she put her comic book into a Photo Gallery widget to get full bleed images. Looks promising. There has been some controversy about the licensing for this software, such as the limitation that you can only sell the resulting iBooks through Apple's iBookstore. (You can give them away on your web site, etc.) The article Why The Emotional Criticism of iBooks Author is Wrong links to some of the critical articles and attempts to address these concerns. There are 172 comments on it as of today, so if you'd like to wade into that, happy reading! My biggest complaint is the totally inadequate Search capabilities on the iBookstore itself. My iBook Tracks in the Sand is about sea turtles, but if you search on "sea turtles" it won't come up. Only books with "sea turtle(s)" in the title or subtitle of the book show up in the search results. It's like trying to find books in a library that has no subject index, which obviously makes it difficult. If Apple is serious about making the iBookstore and its contents useful to teachers and students and readers in general, they need to support key words and/or pick up terms in an iBook's description. Hello?